It’s Record Store Day 2017 tomorrow, so let’s answer the question – “Why 33 1/3”? OK – the basics – “33 1/3” represents the number of revolutions per minute (RPMs) that a standard long play album or LP spins. This can be compared to other speeds that most of us are award of: 78’s and 45’s. These numbers also refer to the RPM of these formats. The 78 came first and from all accounts the speed was somewhat happenstance. Edison had invented the recording cylinder that was hand cranked at a rate equivalent to approximately 70 and 90 RPMs. This was the first phonograph and was originally intended as a dictation machine. A similar device called the graphophone was being developed at the same time in the Volta Labs. The original tin foil recordings surface had been replaced with a better wax surface. It was around this time (1890’s) that Emile Berliner began trying to improve this technology recognizing many of the short coming and of the cylinder recording devices. One advancement was to use a disc rather than a cylinder as the recording medium. Because cylinders and discs are obviously different in shape, it is believed that when Emile Berliner was developing his gramophone which was hand cranked initially, he chose to use the same approximate speed as Edison in order to test his device. Edison had successfully made recordings that had a needle navigating an u dilating groove at speeds equivalent to 70-90 RPMs, so it is believed Berlinger simply chose to adopt the same speed. Whsn it came time to replace the hand crank mechanism with a motor, two of the most common components available let at that time were motors that ran at 3,600 RPMs and a gear with a ratio of 46:1. This results in a speed of 78.26 RPMs. This became the standard speed in the 1920’s. It could be assumed that if Berliner had readily available gears with a 48:1 ratio, the 78 would have been the 75. This was in 1896 and the 78 was the only recorded disc until RCA developed the 33 1/3 in 1931. In part, this was to overcome one of the major weaknesses of the 78: the limited amount of music that could be recorded on each side – approximately 5 minutes. The 33 1/3 was also an attempt to obtain better quality playback. Unfortunately, a poor economy and too few 33 1/3 record players resulted in the ultimate demise of the first attempt at a 33 1/3 LP. The need for more more recording time was driven by the advent of the talking movie which was about 11 in length. In order to accommodate this longer time, a speed of between 28 and 35 RPMs was needed. It is hypothesized that one of the common gear ratios available at that time was 108:1. When combined with the commonly available 3,600 RPM motor of the time, the resulting speed is 33.33 (3600/108=33.33). In 1944, CBS got in of the act with the end result being developed by Peter Goldmark as the Goldmark Microgroove. The smaller groove allowed for between 224 and 300 grooves per inch compared to the existing 80 grooves for 78’s. The original acceptance of 33 1/3 by RCA in 1931 was a compromise between sound quality – the slower the rotation, the poorer the sounds quality – and quantity of recording time. The original microgroove could hold 23 minutes of recorded music. This was a huge increase from the 5 minutes per side of the 78. 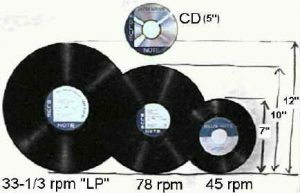 This increase was due Tom the slower speed as well a second an increase in disc size from 10″ to 12″. It is believed that the research done by CBS in the early forties confirmed that 33 1/3 was a reasonable compromise. It would have been easy at that point in time to choose a different speed since there was no installed base of 33 1/3 record players. An interesting side-note, some speech recordings ran at 16 2/3’s doubling the amount of recording time. While this compromised quality, that was of much less concern with recorded speech. Another interesting fun fact, the average length of a groove is 1,500 feet. After posting this I received lots of great feedback and suggestions. First, the 78 was not always a 78. There were discs that revolved at 80 and others at 75. According to Rene Rijz, the HMV catalogue from 1918 specified the record speed. How were the rotational speeds 33, 45 and 78 rpm chosen?